A: Since our tools are used for painting, once they are used, they cannot be resold. Therefore, unless the tools are unused, we cannot issue a full refund. Write us at support@muralsandfauxpainting.com if you would like a partial refund for any tools that haven't been used. If any of the tools arrive damaged, then we can replace them. Customer must pay all shipping costs for returns. Please send registered mail in case the package is lost, so it can be tracked. Unless we receive the package and have proof of delivery, we cannot issue any refunds. A: Yes. We now have the ability to accept credit cards outside the U.S. through PayPal. You don't have to open a PayPal account, either. You can pay the invoice we email you with a credit card. We would prefer that you contact us if you want to know how much the shipping will be ahead of time and to see what shipping options are available for your country. Only Priority by United States Postal Service is available for most countries. You will be charged the exchange rate fee that PayPal charges in order to pay in your currency. An invoice will be sent to your email address. If Paypal is not available in your country, visit http://MyUs.com to use their services for payment and shipping of our products. With their program called personal shopper, you can use a credit card from your country (there is a fee for this service) and they will ship our products to you thru their courier. This is ideal if you are not trusting of your country's postal service. A: When you click on Visit STORE on any page, the store page will have both the Multi-Color Faux Palette and Poofy Pad available for purchase. Only customers who have purchased a kit can order replacement parts. Q: How long do the tools last? A: Our experience has been that at least 6 - 8 uses for the Multi Color Faux Palette and Poofy Pads. However, if when you are faux painting, you keep the tools in a plastic bag when you are not using them and wash them immediately after using, you should be able to get more uses out of them before having to order replacements. Q: When do you ship out the packages? A: If your order is made before 5 p.m.(eastern time), then your package will be shipped within the next 2 days. Q: How long does Priority or First Class shipping take? A: Priority shipping via USPS takes about 2 to 3 days. First Class takes about 2 to 4 days. There are no guarantees by USPS, however. *Note - International orders take 5 to 6 days if mailed International Priority Mail. There are no guarantees by USPS, however. Q: What glazes should I use? A: Unfortunately, because we are not in the faux painting glaze business, we do not want to endorse any particular glaze or paint. If you do a search on the internet, you can find many to choose from. However, we can suggest you try what we use which is Floetrol. It is a paint conditioner used by painters to facilitate spraying the paint but can be used as a glaze. Q: Do you offer classes to learn the Triple S Faux System one on one? A: Yes, we do. However the classes are limited to the Miami and Ft. Lauderdale area in Florida. Please go to our classes page to get more information or contact us at support@muralsandfauxpainting.com You can also call us at 786-554-7710. Q: How much money can one make starting their own faux painting business? A: If you do some research, you will see that professional faux finishers charge anywhere from $2.50 to $10.00 per square feet depending upon the type of faux finishing technique offered. Our experience has been that with the Triple S Faux System, most finishes take up between 2 1/2 to 3 hours for a wall that is 10 ft. high X 10 ft.long. That would mean that you can make $90 an hour and up for most jobs. The faster you are, the more money you can make. Keep in mind that for high ceilings, the jobs will take longer. 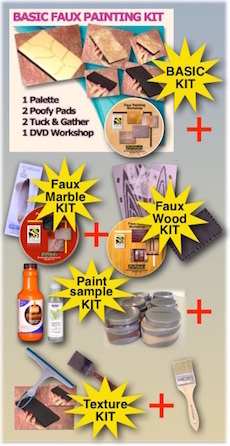 Q: Do you have an affiliate program so others can sell your faux painting kit? A: We hope to have one very soon.